Franklin-Christoph Urushi Red | Inkdependence! 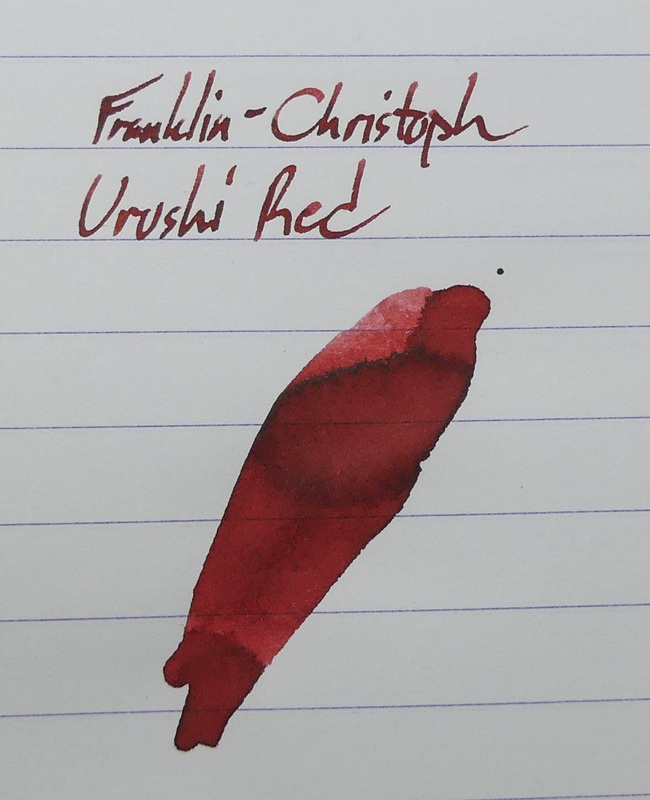 It's another new ink from Franklin-Christoph, and this one has a bunch of shading to it. Urushi Red is a dark reddish ink that shades from a thin pinkish red to a pretty dark brick hue. 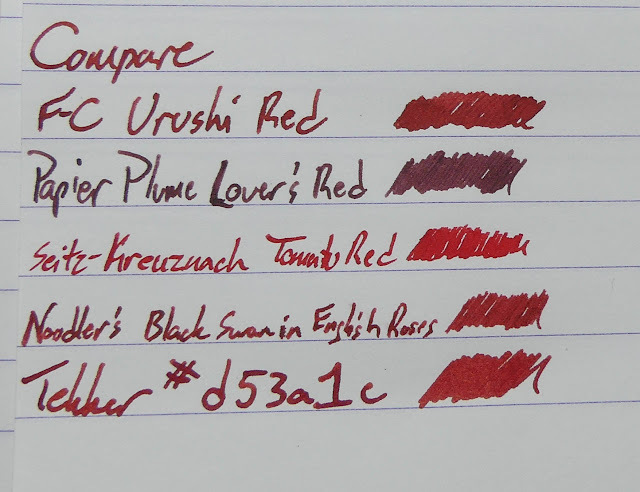 To my eye, it looks like some of the really awesome urushi pens out there. If you're not familiar with what urushi is, well, it's lacquer. 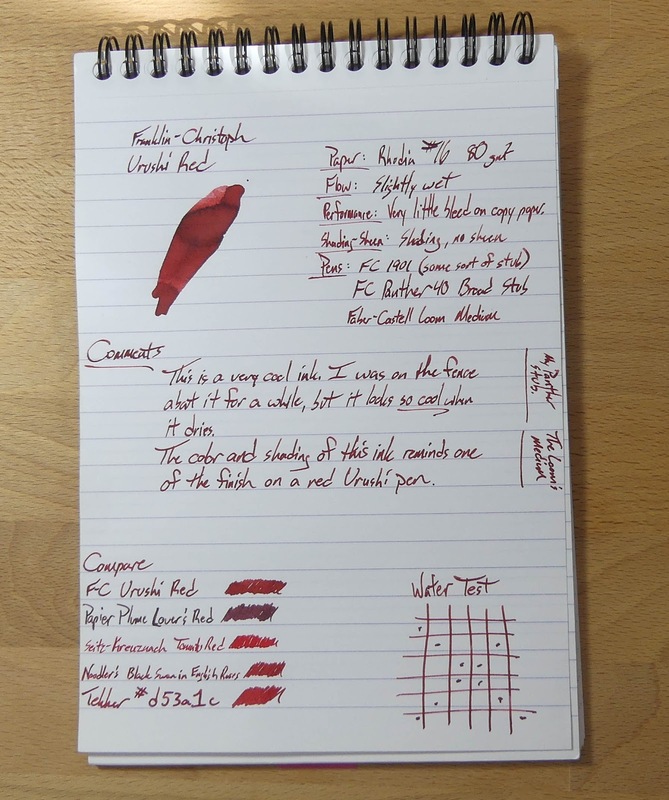 It's pretty hot in the pen world right now (and has been for a while) because the pens that are lacquered with urushi are awesome. The lacquer is applied in dozens of thin layers, and this means that you end up with an incredible depth of color on the pen. Sometimes different colors are used in those layers It also means months of hand-work per pen, and that means a high cost. The other thing is the that urushi lacquer work is meant to last for centuries. Those amazing Japanese lacquer paintings that you might think of when you think of antiquities are done in urushi. Yeah. Expect to pay four figures for an urushi pen. I was really tempted by the one I linked above, but I didn't buy it. Four figures is about one figure out of my comfort zone right now. Maybe one day. This is a picture from the Chatterly Luxuries site. They have lots of beautiful urushi pens. I had this in three pens (and 4 nibs), and I never had any issues with the flow of this ink. No hard starts, and no skipping. It does seems a little thinner than I'm used to in a Franklin-Christoph ink. This was what made me a little skeptical of the ink at first. 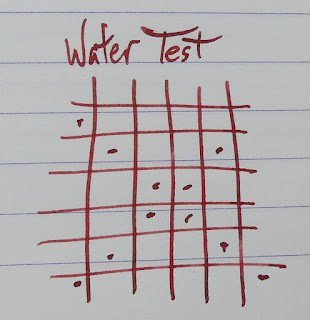 It's just not as satisfying as a really saturated ink when it hits the paper. I was underwhelmed. When it dries, though, it looks really good. The shading and hue that you see in the pictures below is really excellent, and I shouldn't have been so hasty in my estimation of this ink. I'm just noticing that the bottom left corner of the above picture is out of focus. Darn. Well, you'll see the better pictures below anyway. Document photography ain't easy. I'm going to give you some different angles to capture the character of this ink. There's just a little bit of sheen in the picture above, but I wouldn't expect to see that in your regular writing. Maybe if you used a dip pen or something, but I don't think that would work well. I don't like the nib that is in the Black Swan pen. It's just not been acting right. That's my excuse for the weird handwriting, anyway. These two (above and below) are in my Ink Journal with Tomoe River paper. 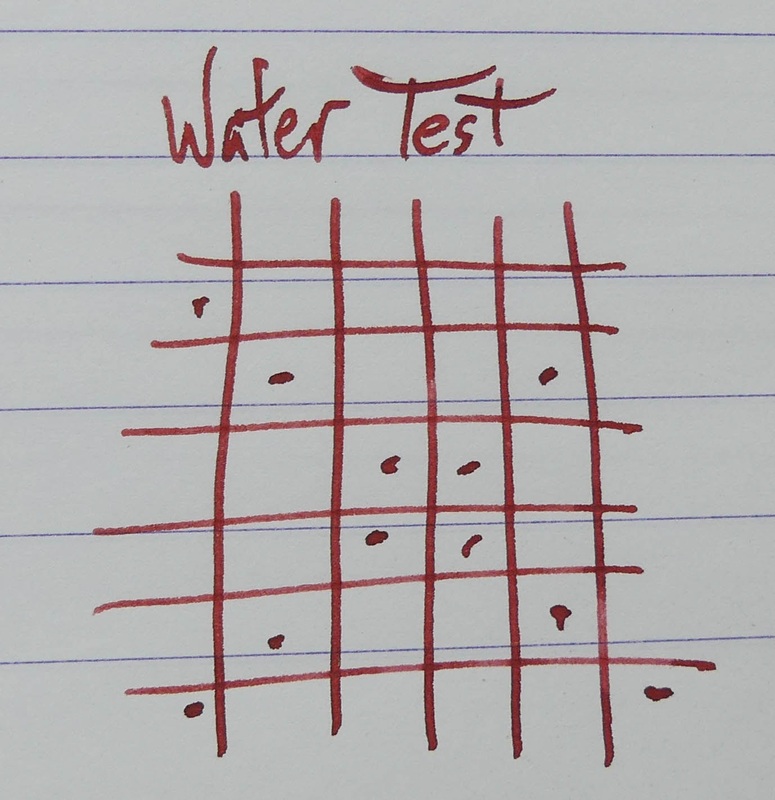 The picture below is in a Currently Inked Journal from Pen Habit's Matt Armstrong. I think it's wheat paper of some sort. 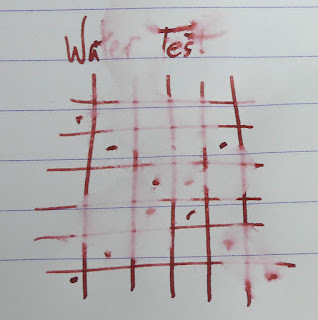 There are some spots of bleed-through in this picture, but keep in mind that 2/3 of these nibs are broad, wet, stubs. 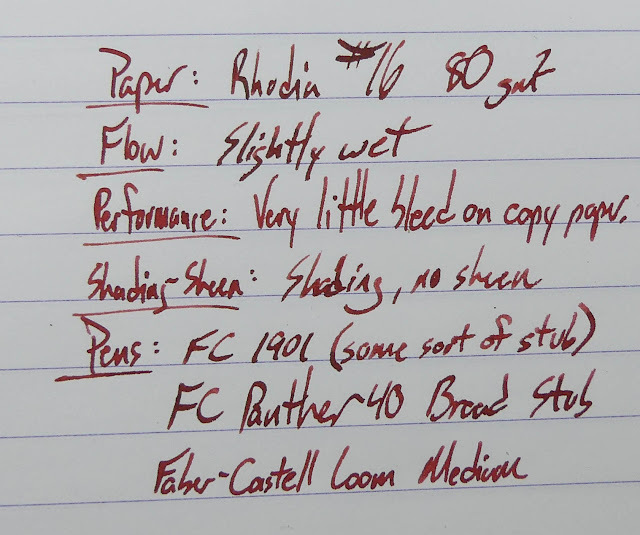 That's pretty good performance for a wettish ink in a nib like that. 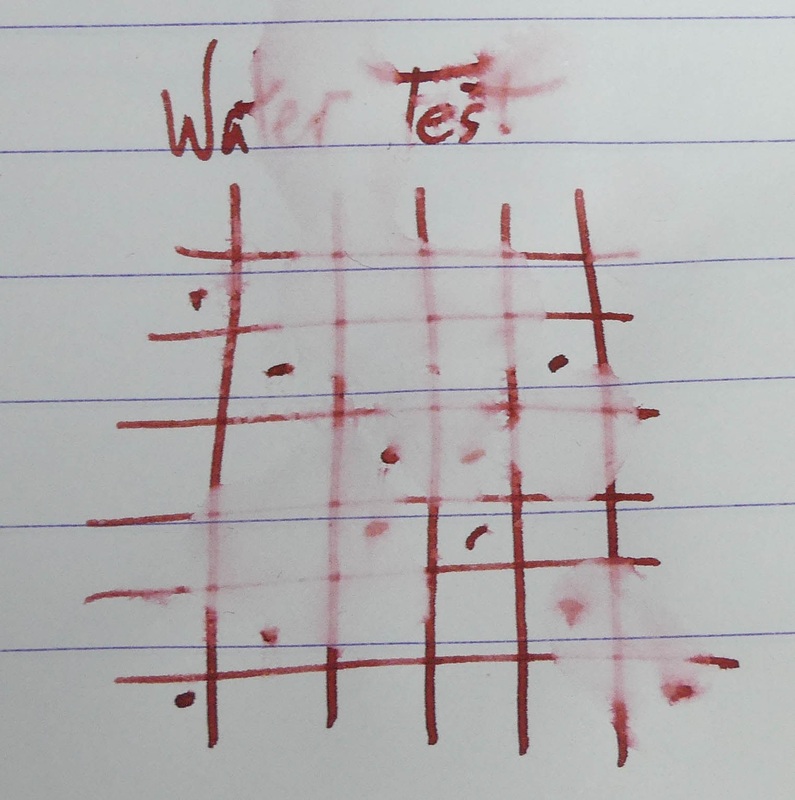 I didn't notice it before, but there's just a hint of violet at the top of that chromatography. Neat! Yeah, really no water resistance. Not a shock. 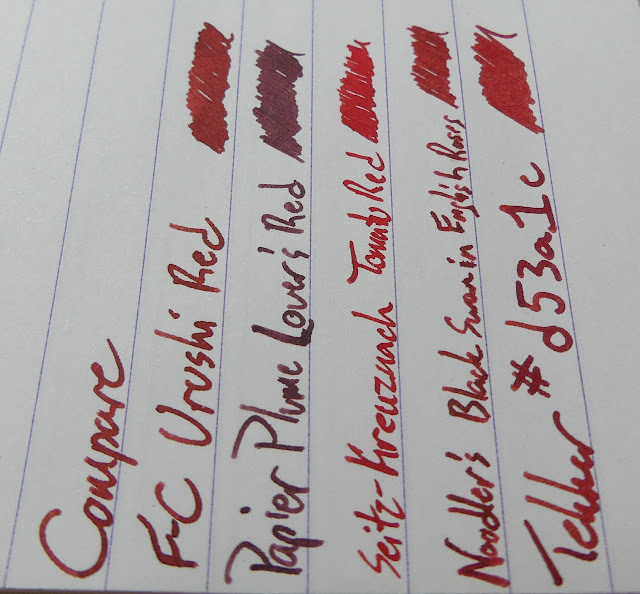 Most red inks don't have much of that for some reason. Okay, so you can find this at the Franklin-Christoph web site for $12.50 in either the regular or the eye-dropper bottle (that's what I got, and you can see it in the video). Both (contrary to what I said in the video) are 2oz bottles. How does Urushi Red compare to Terra Firma? Good question. 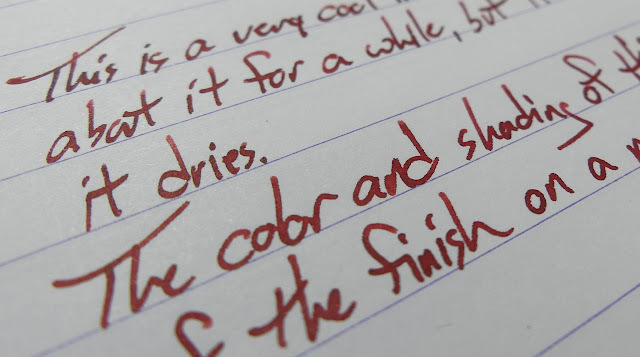 Urushi Red is definitely more red, and I think it has more shading.